Each tomato variety has its own color, flavor, and texture. When preparing canned tomatoes, choose tomato varieties that boast good canning results on the tomato plant’s tag or use a proven Heirloom variety. Some other tomato varieties that work well for canning include Ace, Amish paste, Homestead 24, and Rutgers. Roma or paste tomatoes and slicing varieties are all used for canning. Tomato paste varieties have less juice and, therefore, require less cooking to remove excess water for paste and thick sauces. You can use both interchangeably, but cooking times will vary. Choose nice, ripe, unblemished tomatoes for canning. To ensure the proper acidity level for your variety (4.6 or lower), add an acid, like bottled lemon juice or powdered citric acid: Add 2 tablespoons lemon juice per quart jar or 1 tablespoon lemon juice per pint. If you’re using citric acid, add 1/2 teaspoon per quart and 1/4 teaspoon per pint. Use wide-mouth pints or quart jars for ease in filling. Although not necessary, they will make the entire process go faster and with less mess. Wash and peel the tomatoes. 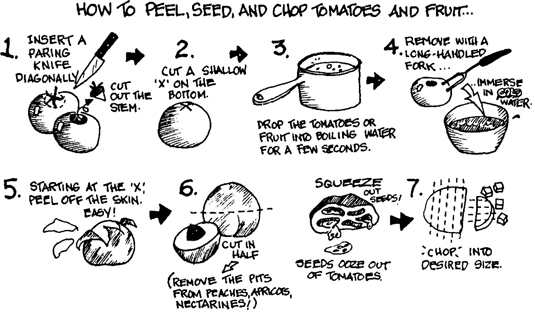 After peeling, cut the larger tomatoes into halves or quarters. To make peeling tomatoes easier, blanch them first to loosen the skins: Dip them in boiling water for 30 seconds and then into cold water. Peeling soft-skinned fruit and tomatoes. To each pint jar, add 1 tablespoon lemon juice or 1/4 teaspoon citric acid and, if desired, 1/2 teaspoon salt. To each quart jar, add 2 tablespoons lemon juice or 1/2 teaspoon citric acid and, if desired, 1 teaspoon salt. If there’s not enough juice to cover the tomatoes, add boiling water to the jars, leaving room for 1/2-inch of air space (headspace) below the lid. Release any air bubbles with a nonreactive utensil, adding more tomatoes as necessary to maintain the proper headspace. Wipe the jar rims; seal the jars with the two-piece caps, hand-tightening the bands. Process the filled jars in a water-bath canner for 35 minutes (pints) or 45 minutes (quarts) from the point of boiling. 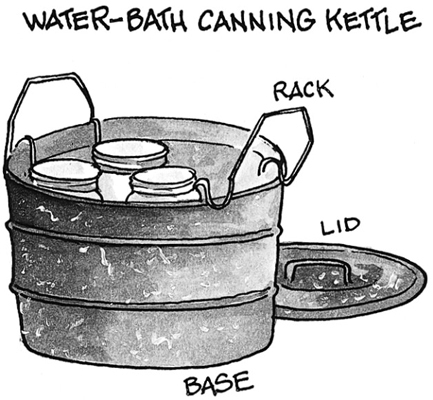 A water-bath canning kettle with the rack hanging on the edge of the kettle. Per 1/2-cup serving: Calories 44 (From fat 6); Fat 1g (Saturated 0g); Cholesterol 0mg; Sodium 19mg; Carbohydrates 10g (Dietary fiber 2g); Protein 2g. With the abundance of tomatoes in the summer months, can some for winter eating. Tomatoes are the best-tasting and easiest produce to keep. Try adding a jar of tomatoes to bow tie pasta and butter for a filling and delicious wintertime treat.